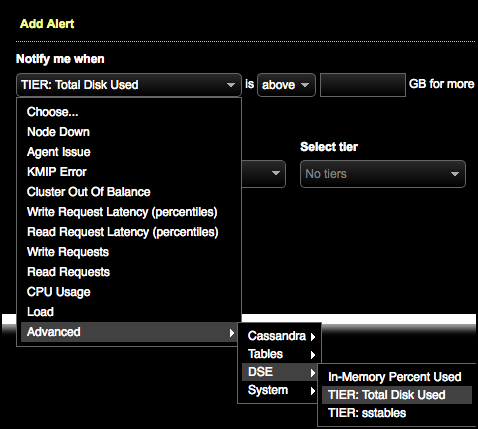 Configure tiered storage alerts to monitor data distribution and performance metrics for storage tiers. Configure tiered storage graphs to visually monitor data distribution and performance metrics for storage tiers. Note: Alerts are not supported for TIER: Max Data Age. For centralized configuration convenience, configure the strategy and tiers in Lifecycle Manager and run a configuration job to push the configuration to all applicable nodes. See DSE Tiered Storagefor complete details. Click Alerts from the main OpsCenter monitoring menu. The Active Alerts dialog appears. Click Manage Alerts > Add Alert. The Add Alert dialog appears. In the Notify me when menu, select Advanced > DSE > TIER: metric name. Specify the notification criteria, the table, and the tier on which to notify as well as the notification frequency.